New Mexico’s First Local Hard Cider Has Arrived! 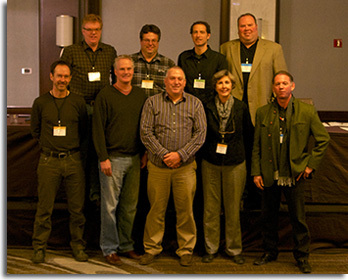 The United States Association of Cider Makers (USACM), the national trade association of the cider industry, has elected a new Board of Directors. After a year of astounding growth in the US hard cider industry, some 200 member cider companies that make up the USACM, met in Chicago as part of their annual Cider Conference. Throughout 2013, the organization worked to grow membership and advance legislative priorities. It led to the creation of the CIDER Act which is currently making its way through the US House and Senate. The bill seeks to create a tax definition for cider that allows for increased carbonation and higher alcohol by volume over what current tax law allows. This announcement kicked off the start of the annual Cider Conference, which provided networking and educational opportunities to cider makers at the Westin Hotel and Conference Center in downtown Chicago. Santa Fe Cider Works will be New Mexico’s first locally made, hand-crafted hard cider to be released in the market this month. Their flagship brand, “The Cider Different,” named after “The City Different,” is an unfiltered, semisweet cider which finishes out at 7% alcohol by volume. 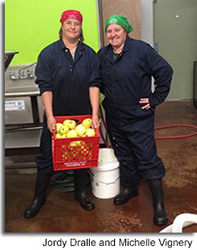 The cider is produced by Jordana “Jordy” Dralle and Michelle Vignery who work together to source, wash and press all of their apples onsite. 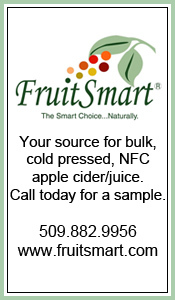 They use three or more varieties of apples and authentic English cider yeast to create a complex yet balanced product. After confirmation of proper aging, Jordy then gives the go-ahead to begin bottling. Jordy, the Production Manager, brings with her two decades of brewing experience from around the country including time spent as the current brewer of Second Street Brewery and Falcon Meadery in Santa Fe. Meanwhile, Michelle, a former public school teacher and non-profit education director, is the Business Manager for the cidery. As the company begins self-distribution in Northern New Mexico, Michelle will serve as the point of contact for Santa Fe Cider Works. After ten years of hobby production and two years of business planning, Santa Fe Cider Works is proud to release its first product to market. 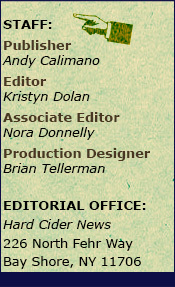 To find out where you can purchase “The Cider Different,” check-out SantaFeCiderWorks.org, or follow them on Facebook. Updates will be posted as retail locations become available. Photo courtesy of Santa Fe Cider Works. 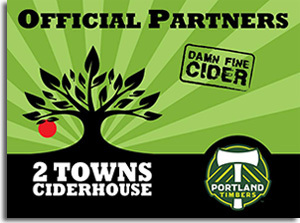 2 Towns Ciderhouse is proud to announce that it has signed on as an Official Partner of the Major League Soccer team, the Portland Timbers, for the 2014 season and beyond. Starting March 8th, 2 Towns Ciderhouse will be available at JELD-WEN Field during Portland Timbers matches, Portland Thorns FC matches and other sporting events held in the stadium. 2 Towns Ciderhouse will proudly showcase its sponsorship via promotional items displayed in locations around the state where 2 Towns ciders are sold. 2 Towns Ciderhouse plans on showing all Timbers matches at its Tap Room located at 33930 SE Eastgate Circle in Corvallis, Oregon. For more information and other special events, please visit 2TownsCiderhouse.com or visit them on Facebook. Tieton Cider Works launched their award-winning craft ciders in the Las Vegas market this month, with the help of Johnson Brothers distributing. Tieton’s award-winning ciders will be available in restaurants, bars and retail, including Lee’s Discount Liquor, in March, and seasonal releases will come later in the year from the Washington State cidery. Sales of hard cider are climbing at a tremendous rate. According to Chicago-based market research firm IRI, sales rose from $35 million in 2009 to $172 million in 2013, making cider one of the fastest-growing alcoholic beverage categories in the United States. Sharon and Craig Campbell, owners of Tieton Cider Works, are thrilled to bring their ciders to Las Vegas and the surrounding area. Tieton Cider Works was founded in 2008 in Washington’s picturesque Yakima Valley, on the land that Mr. Campbell’s grandparents homesteaded nearly a hundred years ago. Now known as Harmony Orchards, it’s home to the largest acreage of cider apples and perry pears in the state of Washington. With the creativity and skill of cider maker Marcus Robert, a Yakima Valley farmer himself, Tieton produces twelve varieties of naturally gluten-free hard cider that have garnered national awards since the first bottling. From branch to bottle, Tieton Cider Works controls every aspect of the growing and cider making process, and as the cider industry has grown, Tieton Cider Works has emerged as a leader in both craft and quality. Tieton’s ciders available with Johnson Brothers' include the Wild Washington Apple Cider, Cherry Blend, Apricot, Yakima Valley Dry Hopped, Cidermaker’s Reserve, Tieton Frost, and Tieton Wind. Seasonal ciders will also be released throughout the year. 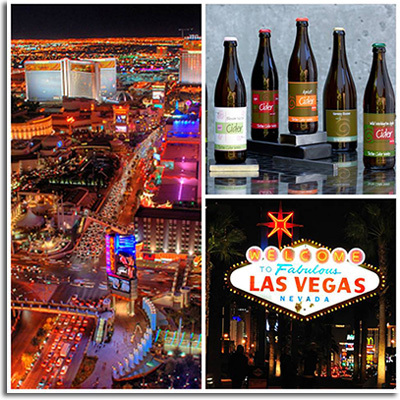 Johnson Brothers of Nevada, established in 2001, supplies all of Southern Nevada with both imported and domestic wines, spirits, craft beers and now craft ciders. These beverages can be found in fine restaurants and world-class casino resorts along the Vegas strip. To learn more about Tieton Cider Works visit TietonCiderWorks.com. For information about Johnson Brothers of Nevada, visit JohnsonBrothersOfNV.com. As the cider industry continues to boom, we are continually introduced to new reading material that keeps us up to date on the beverage, the market, and the practice of cidermaking. World’s Best Cider: Taste, Tradition, and Terroir by Pete Brown and Bill Bradshaw and The New Cider Maker’s Handbook: A Comprehensive Guide for Craft Producers by Claude Jolicoeur are two must reads for those with an interest in cider. 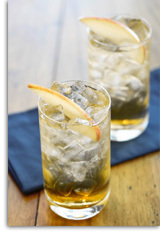 World’s Best Cider provides you everything you need to know about cider as a beverage. The book is a beautifully photographed guide that taps into the cider trend, presenting more than 500 ciders from both artisan makers and global brands. Featuring in-depth explanations and tasting notes, it reveals all you need to know about the cider making process, producers, and cideries across the globe. 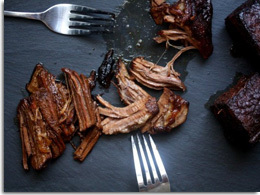 Further, recipes for cider-based dishes complete the phenomenal guide. Brown and Bradshaw present the fascinating history of cider and explain the basics – what cider is, how it’s made, and the different styles. Entire sections focus on the cider centers of the world – Spain, Germany, Austria, United Kingdom, Ireland, United States of America, Canada, Australia and New Zealand, Argentina, and South Africa. While reading, you will explore each countries cider traditions and find cider suggestions and producer contact information. Key regions, such as Normandy, Somerset, and the Pacific Northwest, are also reviewed in more detail. Moreover, you’ll learn about several notable cider makers including Eric Bordelet and Steve Wood. The New Cider Maker’s Handbook appeals to both serious amateurs and professional cider makers who want to increase their knowledge, as well as to orchardists who want to grow cider apples for local or regional producers. Novices will appreciate the overview of the cider-making process, and as they develop skills and confidence, the more in-depth technical information will serve as an invaluable reference that will be consulted again and again. Both books are available for purchase now. 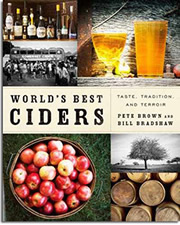 World’s Best Cider by Pete Brown and Bill Bradshaw (ISBN: 978-1-4549-0788-6) is 256 pages and retails for $30.00. 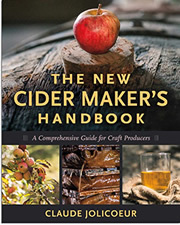 The New Cider Maker’s Handbook by Claude Jolicoeur (ISBN: 978-1-6035-8473-9) is 352 pages and retails for $44.95. Governor Andrew M. Cuomo announced on February 14 that Nine Pin Cider Works, a New York craft cider company producing hard cider from Capital District and Hudson Valley apples, became the first licensed farm cidery in New York State. In October 2013, Governor Cuomo signed legislation establishing a new license for farm cideries to increase opportunities for this growing agricultural industry. The new legislation went into effect on January 15. Nine Pin Cider Works applied on January 21, and the license was approved by the State Liquor Authority (SLA) just 22 days later. 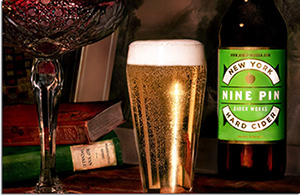 Nine Pin Cider Works is operated by the del Peral family in Albany. The company’s products deliver a crisp, refreshing taste using farm fresh fruit including apples grown from seed on the del Peral family farm. In 2013 Alejandro del Peral perfected his own cider blend, winning a gold medal at the Great Lakes International Cider & Perry Competition. His winning, noncommercial cider was called Catskill Thunder. "The cider-making process represents the incredible spirit of where the apples are grown. New York State's climate gives apple producers an outstanding environment to grow great apples for cider making. It's an incredible honor to become the state's first licensed cidery here in Downtown Albany under the new Farm Cideries Law. We applaud Governor Cuomo for his dedication to making New York open to business to hard cider producers such as Nine Pin," said Alejandro del Peral, Cider Maker at Nine Pin Cider Works. Since 2011, the number of hard cider producers in New York has risen 360 percent, from five to 23 p roducers. The law signed by the Governor in October 2013 authorizes the licensing of farm cideries for the manufacture and sale of cider made from crops grown in New York State and excludes licensed farm cideries from the sales tax information return filing requirements. In order to obtain a farm cidery license, the hard cider must be made exclusively from apples and other pome fruits grown in New York State, and no more than 150,000 gallons may be produced annually. In addition, the limit on the alcohol content for cider has been raised from 7 percent to 8.5 percent, thereby addressing the vagaries of the fermentation process. Most significantly, if a cider producer’s product meets the definition of both hard cider and wine, the law affords the producer the choice of whether the product will be marketed and sold as wine or cider, based on their individual business and marketing needs. The new farm cideries also have privileges beyond the traditional cidery license, and may offer tastings of, and sell not only cider, but also beer, wine, and spirits made from New York products. In addition, because farm cideries may also sell products such as mustards, sauces, jams, jellies, souvenirs, artwork, crafts and other gift items, these businesses, much like farm wineries, will become destination locations that will promote tourism within their communities. For more information on Nine Pin Cider, visit NinePinCiderWorks.com. To apply for a farm cidery license in New York State, please visit the New York State Liquor Authority website.